A perfectly refreshing dessert similar to Hawaiian Shaved Ice, this is the Filipino version. Order Hawaiian Shaved Ice Machine- Keep cool this summer with your very own Hawaiian shaved ice machine. Perfect for making shaved ice and halo halo desserts!! In 4 tall sundae or milk shake glasses, place 3/4 cup shaved ice. On top of that, add 1/4 cup each of mango, pineapple, jackfruit, macapuno strings, and purple yam. Pour 1/2 cup (125 ml) evaporated milk and some of the jackfruit juice into each glass. Top the halo-halo with a scoop of vanilla ice cream. Serve with long ice cream spoons to mix the layers together. Variation: If you don’t feel like buying each ingredient separately, prepared halo-halo fruit mixes are available at the Asian grocer. These convenient, pre-made mixes come in glass jars and, depending on the brand, include a combination of halo-halo staples such as sweetened beans, coconut sport, purple yam, coconut gel, and palm nuts. Place a few spoonfuls of the mix in a glass, then top with shaved ice, evaporated milk, and vanilla ice cream for a nearly instant halo-halo. I find the mixes are a great base to which you can add your favorite fruits such as jackfruit, litchi, banana, mango, papaya, or guava. One of the keys to an authentic halo-halo is shaved ice. Though crushing ice in a blender may seem like a viable alternative, a blender can’t process ice into the fine flakes that make halo-halo unique. 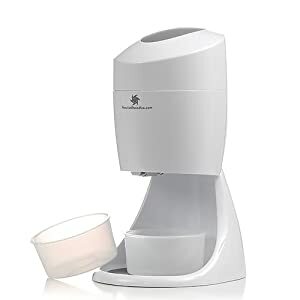 Since shaved ice drinks and desserts are popular throughout Asia, you’ll be sure to find either an electric or manual ice shaver at an Asian grocer. They are also available at large chain stores that sell kitchen goods.